Made with 100% sunflower oil. Perfect for fajitas, burritos & sandwiches. Preservative free. Suitable for vegetarians. 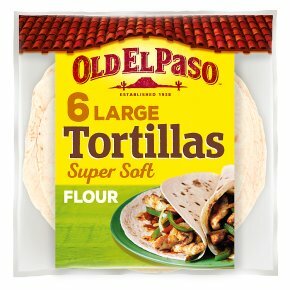 Make any dinner a Mexican meal with Old El Paso Tortillas and Stand 'N' Stuff wraps Perfectly rollable and delicious- our range of Mexican tortilla wraps are great for Fajitas, Burritos and Enchiladas Try our Stand 'N' Stuff Flour Tortillas, they are perfect for holding all your delicious Mexican filings to create the perfect Fajita or Burrito!